Tomorrow starts a great new feature by a variety of your favorite SLP bloggers. 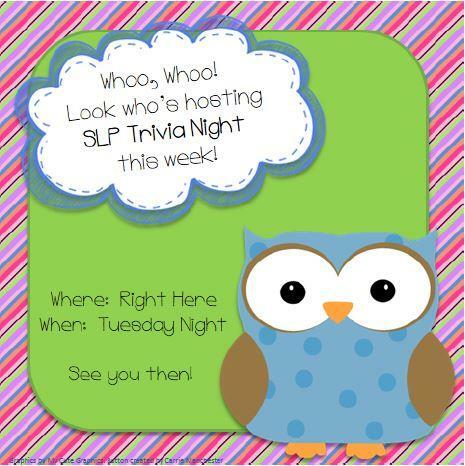 We are taking turns hosting SLP Trivia Nights! Tomorrow I will be hosting this event on my Speech Universe Facebook page at 9:00 p.m. (EST). I am going to have three different rounds. The first one at 9:00 will focus on getting to know my blog and TpT store a little bit. The second round at 9:10 will focus on Autism. The third round at 9:20 will focus on Augmentative and Alternative Communication. There will be five questions in each round. I will have you email me the answers to all five questions at speechuniverse@gmail.com. After 10 minutes, I will choose three winners via random.org from the pool of people who got all five questions correct. Winners will receive a choice of product from my TpT store! Thanks to Kristin over at Simpy Speech for setting this up! Thanks also to Carrie over at Carries Speech Corner for the super cute graphic at the top of this page! Hope you all have fun with SLP Trivia Nights! You can look forward to months of fun that are already scheduled into January 2014! This sounds like fun! I'll look forward to checking it out on Tuesday. I am looking forward to this for sure! Sadly I won't be able to join tomorrow night (internet is not working at my home). I will have to watch out for next week's trivia! Great! I hope to be at the computer to participate tonight. Yay!